Have you ever wondered if you would be able to win the hunger games, or what character you might be? If you were ever in the situation what might you do in the arena? Do you love the Hunger Games and what to learn more about yourself? Take a look at this chart and find out! This is a fun and informative chart whether you prefer the books or movies. This chart is perfect if you ever wondered what Panem district you might be from, or how you would fair in this post-apocalyptic society. The chart is divided between Idealists, Artisans, Guardians, and Rationalists. It easy to pinpoint where you might fall. If you’re an Idealist and interested in others well being, then you might be a counselor like sweet Rue. Would you love a life on the stage and can think quickly on your feet? You might just be a Promoter like Caesar who falls into the Artisan category. If you would volunteer for someone you love, then you might be a Guardian and Protector like Katniss Everdeen. Do you have a knack for cake design, or would help loved ones no matter what would happen to you? Then Peeta might be a character you can identify with. If you’re spontaneous like Cinna and costume design is more up your alley then you might be an ENFJ Idealist. Do you identify with the hated Snow? Don’t worry, it doesn’t mean you’re evil but just that you’re a leader who likes things their way. By using this personality chart, you can compare yourself with all your favorite and least favorite characters. You’ll see what MBTI they are most likely to be and also learn more about them too. Whatever your results might be, may the odds be ever in your favor. Peeta is definitrly extraverted. According to Katniss he is good with words and he is very open for new people. Also he is a feeler, not a thinker. Giving the bread to starving Katniss wasn’t an action of logic. Also teaming up with the careers to save Katniss and turn against Cato was an act of feeling, not of thinking. I would also entitle him as a dreamer (N), because he enters the game with the moral “one of district 12 could actually win”. 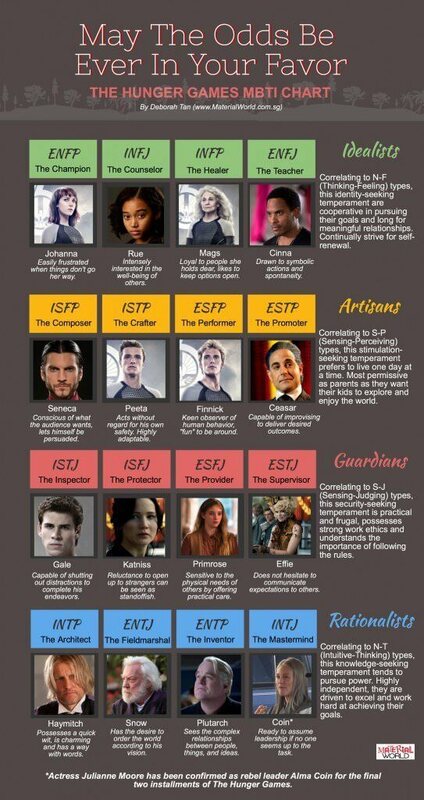 I think Peeta is a stereotypical ENFP. I also think some other parts of this charts are quiet inaccurate, but at least thanks to the person who made this.